The SureFire P90 Lamp Assembly is a specially engineered lamp that, when combined with its designated and carefully engineered reflector, will produce SureFire's brilliant and perfectly-focused beam. The reflector is either integral to the head of your flashlight, or part of the prefocused lamp assembly. 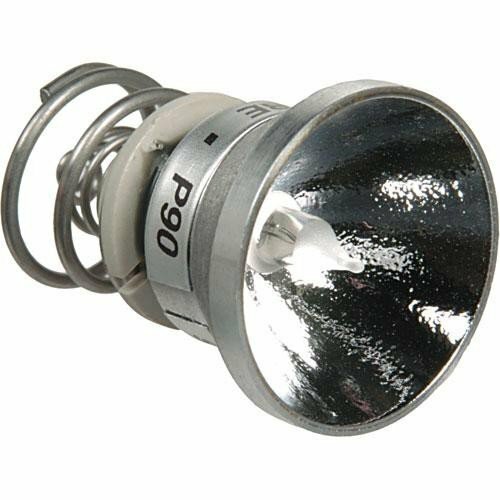 You can purchase either standard high-output replacement lamps for your flashlight, or optional ultra-high output lamps that nearly double the light output (available for most flashlight models). Ultra-high output lamps use more energy, and therefore deplete batteries more quickly. The P90 is a standard replacement lamp with an integral reflector for the 9P, C3, D3, & Z3 flashlights. It produces a 105 lumen for 60 minutes.